Administrative/Biographical HistoryEric Sonner (birth name Eric Sonnenschein, b. 1916 in Šumperk, Moravia, Austrian Empire) and Rose Sonner (née Ruzena or Roszi Deutsch, b. 1917 in Veľká Bytča, Trencsén county, Kingdom of Hungary) were Ashkenazi Jews from what is now the Czech Republic; both lost their first spouses during the Holocaust. They married in 1947 and immigrated to Vancouver, via Gottenberg, New York and Toronto, in 1949. Rose Sonner, who spent the bulk of the war in Terezín, did administrative work for the Jewish self-administration in the ghetto in Theresienstadt. Eric Sonner was enrolled in the Agriculture Program at a Prague university when Germany occupied Czechoslovakia in 1938–1939. In 1942, he was deported to the ghetto in Theresienstadt (Terezín), where he worked at a plot of land used to grow fruit and vegetables for the camp. 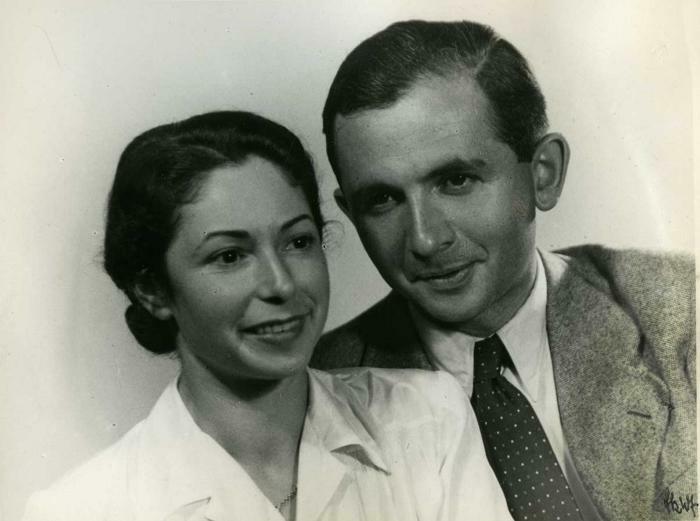 Near the end of the war, Eric was transported from Terezín to Auschwitz, where he remained for five to six weeks, before being moved to Dachau Kaufering #11. He escaped during this move by jumping out of a train car, with other prisoners, and fleeing to nearby farmhouses, in April 1945. After the war, Eric and Rose each returned to Prague, where they first met. They married March 12, 1947. Eric completed a doctorate in plant breeding and genetics during this period, producing a thesis examining the effects of polyploidy in cucumbers. The family immigrated to North America and settled in Vancouver, where Rose found work as a seamstress at a clothing store on Granville Street. Eric was hired by the University of British Columbia's Horticultural Department in 1949. The couple and their two daughters changed their family name to Sonner in 1955. A third daughter was born in 1957. Rose Sonner died in 1971. Eric Sonner remarried in 1981 to Rita Edna Israels, who died in 2003. Eric Sonner died in 2009. Scope & ContentCollection consists of vital records, administrative documents, original drawings, publications, educational certificates, academic papers, photographs, correspondence, letters of reference and audio-visual testimony relating to the life and work of Eric and Rose Sonner. Records detail the vital statistics, career history, education, travels and emigration efforts of the family from the late 1940s until the mid-2000s. Collection is arranged in the following series: Terezín (1942–1945); Prague (1946–1949); Academic works (horticulture) (1947–1950); Correspondence and ephemera (1949–2000); Vital records (Canada) (1949–2007); Eric Sonner testimony ([194-]–[before 2009]); and Photographs ([192-], 2016). Immediate Source of Acquisition or TransferRecords were maintained by Rose and Eric Sonner until their deaths in 1971 and 2009 respectively, after which time they were kept by their daughters, Nora and Eve. Nora Stevenson donated materials to the VHEC in 2012. A second donation was received from Eve Sonner in 2016. NoteSelect items only have been described at the item level. Other items have been digitized and scans used to illustrate fonds, series and file-level descriptions. Consult the archivist for more information. System of ArrangementOriginal order has been preserved where it existed. Series were developed by the archivist to reflect the functions and existing organization of the records. See Sonner research file for additional information. Date of DescriptionFinding Aid prepared by Myron Groover in June 2013. Updated August 2016 by Shyla Seller with description of accrual.